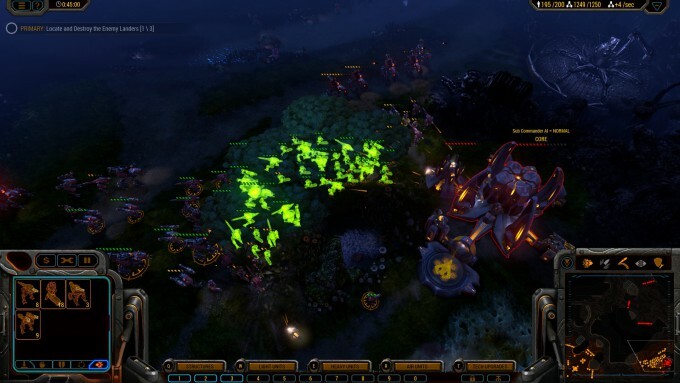 Grey Goo is the newest kid on the real-time strategy block. It was created by veteran RTS studio Petroglyph, and while this title may have the pedigree, does it mean that it will win our hearts and minds when going up against the crowd favorite MOBA? There’s only one way to find out. There is something that has been keeping me back from playing MOBAs. While I can’t quite say what it is that I dislike, I can tell you what I’ve felt has been missing. 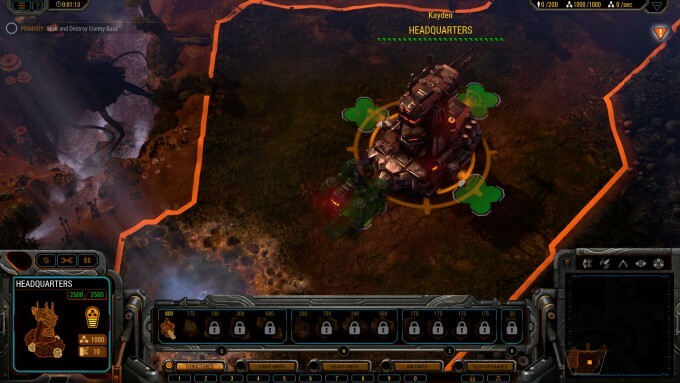 I have been yearning for a game that plays similar to Star Craft and other RTS games of yesteryear. 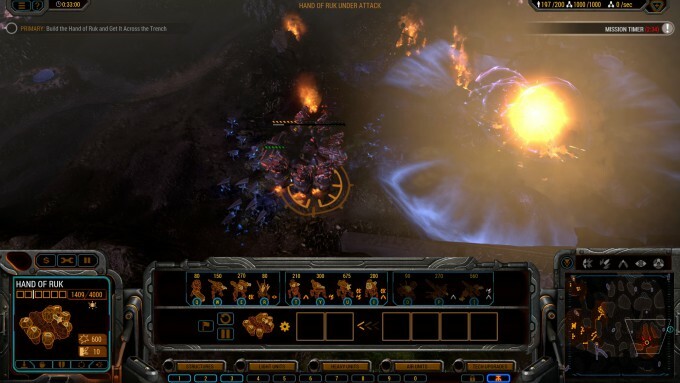 This craving is now being fulfilled by Petroglyph’s new game Grey Goo. This is an old-school RTS with some focus on unit advancement but nothing as deep as a hero or ranking system. There is an option to upgrade your units from 1 of 3 unique options in special buildings. This way they aren’t obsolete when you get to the end game. The resources are also very simple; you only collect catalyst to build anything. These simple mechanics may not appeal to many players but it doesn’t bog the game down with worry and being wiped out quickly by a superior force. Players are always going to be on the same playing field when it comes to units and range. The AI, however, is greatly superior to human players in this regard. This makes them capable of causing havoc when they shouldn’t have the ability to do so. While testing multiplayer and single-player, I found the AI had a diverse range of advantages. For example, they could fire from distances I could not see them from. I wasn’t even detecting cloaked units. But when I played the same race as those units, I had no such advantage. This was painfully obvious when the AI was playing the Goo on a MP map with one other human and one other AI where it was playing the Beta. 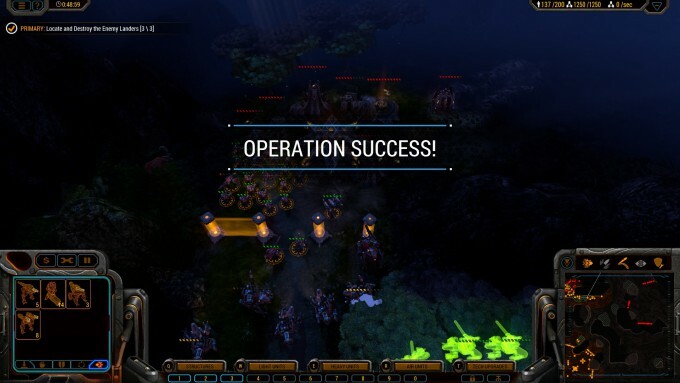 The Goo AI had not only taken over half of the map and contained the other AI, it also managed to seemingly go beyond the unit limit imposed on human players. I do not mind a challenge if I ask for it but I was just testing out the MP with someone who had not played the game before; we put the AI on easy and we got stomped. The MP has several other issues such as some disconnects when starting a map, very limited map selection, and a shortage rule and victory options. When the game did work, it was flawless. Unfortunately, when trying to find other people play with, there was no one else playing an open match. There are, of course, many reasons for lack of players, but it’s hard to deny that without a demo of some sort, not many MOBA players will consider this game because it is just too different. Word of mouth feedback is going to be a big factor for this game’s longevity. A sore point is the lack of multiplayer maps because the game only offers eight. This is sort of offset by the map editor but there is no easy way to share a map with the community. It would have been nice to see the inclusion of the Steam Workshop to make sharing with the community easier. The single-player mode was an interesting and fun experience. While the story was a little on the familiar side, it told an interesting story that still left me asking many questions by the end of it. I mentioned before the AI having advantages over the player; well, it is much more apparent in the SP. I felt the AI advantages bordered on the absurd but considering we are following a narrative it is easier not to hold it against the game. The single-player experience also let me get to know each of the factions intimately. The Betas are the first group you play and they are the most primitive group. They still use projectile weapons, rockets for thrust and have personnel on the ground. The Humans are next up and are the most technologically-advanced group. This provides a unique a twist from the standpoint of the story because generally humans usually are the inferior faction. The Goo is the last group you play and by far the most unique. The Mother Goo is the home base but it is mobile. This makes the Goo the most mobile and versatile fighting force if you can keep pumping out the units while the base feeds on resources. There was even a time I loathed having to play the Goo but I quickly changed my mind when I got used to them in the story. Bravo to Petroglyph for making each race’s units varied enough to feel unique but not too weak against another faction at any point. While I wasn’t through the moon with the graphics, I was particularly impressed with the Goos’ animation: it felt very alien but organic and sort of disgusting all at the same time. Sadly the performance threshold is very high with this game. There was a lot of work to make things look good but there is hardly any optimization. A video should not drop down to the teens in frames per-second when running a NVIDIA 980 GTX. The music is spectacular in every way. There is a lot I can say about it, but you truly have to play the game to feel how immersive it is. The game also provides its own music player so players can listen to the sound track any way they want. The sound effects are loud and exclusive in the places need to be, like the explosions from the Hand of Ruk and the noises made from the Goo are unique. The voice acting can be a little dry at times; you can tell the actors are reading from a page. Thankfully the dialogue isn’t very long. 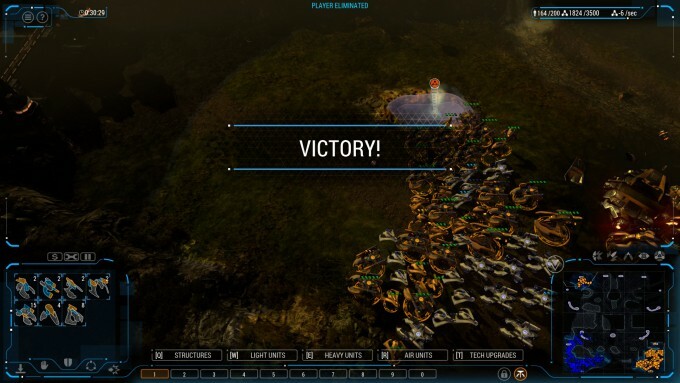 In the end, Grey Goo takes us back to when RTSes were more focused on strategy rather than fast paced combat. This is a great selling point but building a community is always hard and the inclusion of a map editor will help strengthen the community but without a demo to help motivate interest. I worry this will not reach as broad of an audience and after a while, become a stagnant puddle of goo. Balanced units – against human players.